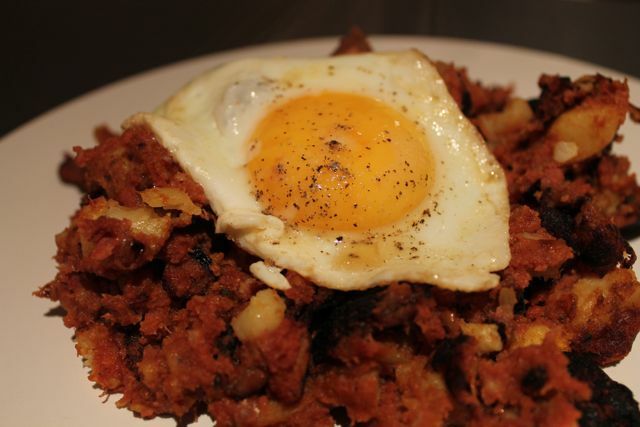 I hardly ever had corned beef hash growing up; it wasn’t a dish on our regular circulation of dinners. But, my Dad would sometimes make it when my Mum was working late as a quick meal for himself and as I got older, I fell in love with it! I started having serious cravings for it last week so I bought all the ingredients and phoned him for a quick recipe recap before I made it. His method is simple and easy but I was obsessing about having lots of crispy bits on the bottom, so it took ages to cook and was in the pan for about 20 minutes! If you don’t obsess over crispy bits it probably takes about 30 minutes from start to finish, perfect for week-night dinners. It is also incredibly cheap; although I was greedy and ate mine in two servings, it should really serve four. Corned beef is less than £2 for the tin, potatoes and onions are dead cheap and everything else is just bits and bobs of spices, sauces and flavours. The dish is very filling and perfect for wintery nights, I feel like I need to cook it again very soon! Boil the cubed potatoes until nearly cooked through. Start frying the onions in a frying pan with oil (I used Frylight as I’m still meant to be on a diet…I just keep forgetting…) and add the cubed potatoes once cooked through. Fry both until the potatoes are starting to get crispy around the edges and the onions are light brown. Cube the corned beef and add it to the potatoes and onions. I had a slight issue here as my frying pan was not big enough to hold all the food so I had to use a smaller one as a back-up and split the mixture. Bit of a nightmare and I don’t recommend it; use the biggest frying pan you have!!) Fry the corned beef until it is hot through (obviously it’s already cooked) and add as much worcestershire sauce and ketchup as you like. I added a fair bit of both as I like a strong tasting hash. 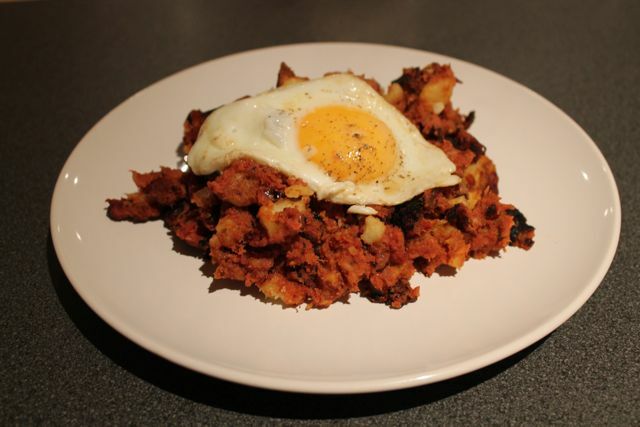 I then cooked the hash for a futher 15/20 minutes to ensure I had a lot of crispy bits. 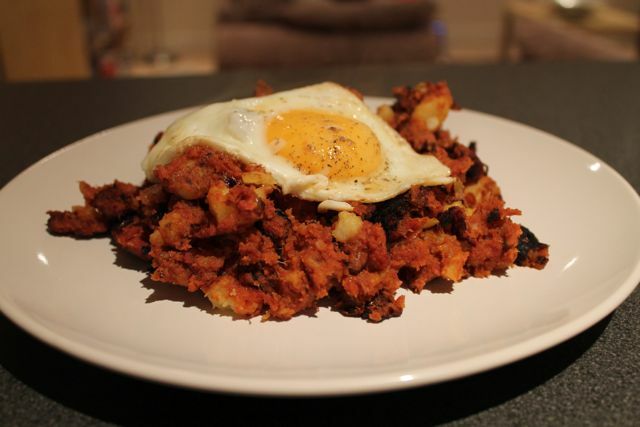 Fry your egg, season the hash and serve the egg on top of the hash. Posh!! Not at all. Mine does look quite posh but that’s just because I have an amazing camera. The following evening, I ate my hash in a big bowl with a fork. Classy!